Elyte incontinence pads are soft, 100% cotton keeping you drier, fresher than synthetic ones. Women's incontinence pads stay secured with self-adhesive strips. Hypoallergenic pads are available in cases of 120. Imported. Express shipping not available for cases. 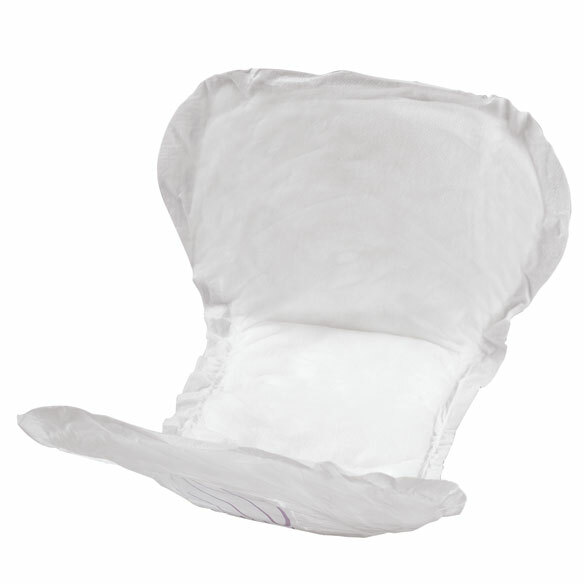 For 90 year old Mom's longterm incontinence use, a soft, hypoallergenic alternative to typical pads. Does not rub skin like typical pads. We use the largest pad instead of adult diapers. 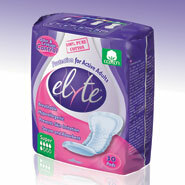 I love these I use them for monthly periods. I would like to order them again but I don't have a way to pay forthem. Use this every day. This product works very well. Provides great protection. My 97 year old mom is finally enjoying intact skin on her bottom and a dry bed at night! She loves the absorbency and softness of this product. We discovered it by accident and hope we will be able to keep it on hand! Prior to this, her "cheeks" were almost leathery and a constant source of itchy irritation. Now she is down to regular underwear and one of your pads during the day, wears 2 at night and I don't have to change the linens in the morning. Have recommended to several friends... THANK YOU! Love the softness that cotton brings. Does not irritate like other pads. Absorbs significant amount without leaking. These do not hold much liquid before there is leakage all over. I will never buy any more. I like these pads better than any I have ever used. My mother loves these, protects her more than other items she had purchased. This product provides me super all day comfort and security. I like the feel of this pad aginst my skin between my ove hight pads, I also wear them in day time over my other regular pads. I need hypoallergenic pads. These seem to fit the bill ! These are the best! Comfortable, non-irritating, very good coverage, and good capacity. for my mother and she likes these compared to numerous others she has tried. Description, brand name, and price. Like the way they absorb. Mom said buy this one. It's very hard to find pads that does not have purple dye in the pads. i'm very sensitive to the dye. Very happy to find a pad like this. I need protection I can count on! Product is great - wonderful absorbency during night time hours. Product I am using does not work well.Hoping this does. I like the fact they're cotton. Love the softness of these pads. any difference in length between the 2 sizes ? BEST ANSWER: Thank you for your question. 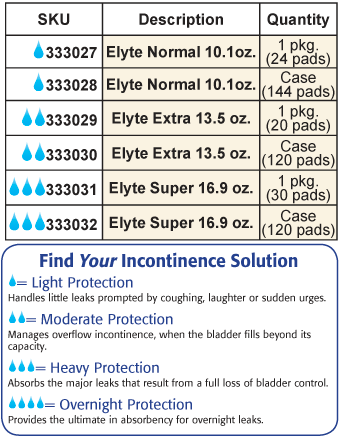 The Elyte Incontinence Pads are 17" long by 4" wide in the middle and 8" long at the ends and Extra Large pads are 13" long by 5" wide. We hope this information will be of help to you. So are these the ones that are 17" long by 4" wide in the middle and 8" long ? BEST ANSWER: Thank you for your question. The pads measure 17” long x 4” wide in the middle & 8” wide at the ends. We hope this information will be of help to you.